Peter Lorre caused an international sensation with his portrayal of a serial killer who preys on little girls in the German film M (1931). He later became a popular featured player in Hollywood crime films and mysteries (in particular with Humphrey Bogart and Sydney Greenstreet), and, though frequently typecast as a sinister foreigner, became star of the successful Mr. Moto detective series. Peter Lorre was born László Löwenstein on 26 June 1904, as the first child of Jewish couple Alajos Löwenstein and Elvira Freischberger, in the Austrian-Hungarian town of Rózsahegy in present-day Slovakia, then known by its Hungarian name Ružomberok. His parents had recently moved there, following his father’s appointment as chief bookkeeper at a local textile mill. Beside working as a bookkeeper, Alajos Löwenstein also served as a lieutenant in the Austrian army reserve, which meant that he was often away on military maneuvers. When Lorre was four years old, his mother died, probably of food poisoning, leaving Alajos with three very young sons, the youngest only a couple of months old. He soon remarried, to his wife’s best friend, Melanie Klein, with whom he had two more children. However, Lorre and his stepmother never got on, and this colored his childhood memories. At the outbreak of the Second Balkan War in 1913, Alajos moved the family to Vienna, anticipating that this would lead to a larger conflict and that he would be called up. He was, at the outbreak of World War I in 1914, and served on the Eastern front during the winter of 1914-1915, before being put in charge of a prison camp due to heart trouble. 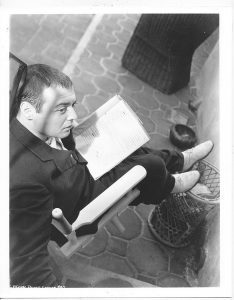 Peter Lorre began acting on stage in Vienna at the age of 17, where he worked with the famous Viennese Art Nouveau artist and puppeteer Richard Teschner. He then moved to the then German town of Breslau, and later to Zurich in Switzerland. In the late 1920s, the young and short (165 cm (5 ft 5 in)) actor moved to Berlin, where he worked with German playwright Bertolt Brecht, including a role in Brecht’s Mann ist Mann and as Dr. Nakamura in the musical Happy End (music by composer Kurt Weill), alongside Brecht’s wife Helene Weigel and co-stars Carola Neher, Oskar Homolka and Kurt Gerron. The actor became much more widely known after director Fritz Lang cast him as a child-killer in the film M (1931). In 1932 he appeared alongside Hans Albers in the science fiction film F.P.1 antwortet nicht about an artificial island in the mid-Atlantic. When the Nazis came to power in Germany in 1933, Lorre took refuge first in Paris and then London, where he was noticed by Ivor Montagu, Alfred Hitchcock’s associate producer for The Man Who Knew Too Much (1934), who reminded the director about Lorre’s performance in M. They first considered him to play the assassin in the film, but wanted to use him in a larger role, despite his limited command of English, which Lorre overcame by learning much of his part phonetically. He also was featured in Hitchcock’s Secret Agent (1936). 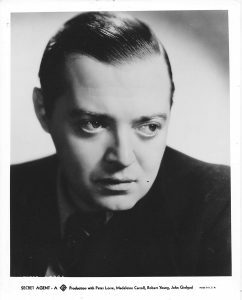 Eventually, Peter Lorre went to Hollywood, where he specialized in playing sinister foreigners, beginning with Mad Love (1935), directed by Karl Freund. He starred in a series of Mr. Moto movies, a parallel to the better known Charlie Chan series, in which he played John P. Marquand’s seminal character, a Japanese detective and spy. He did not enjoy these films — and twisted his shoulder during a stunt in Mr. Moto Takes a Vacation— but they were lucrative for the studio and gained Lorre many new fans. In 1939, he was picked to play the role that would eventually go to Basil Rathbone in Son of Frankenstein; Lorre had to decline the part due to illness. In 1940, Peter Lorre co-starred with fellow horror actors Bela Lugosi and Boris Karloff in the Kay Kyser movie You’ll Find Out. 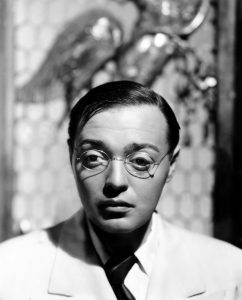 Peter Lorre enjoyed considerable popularity as a featured player in Warner Bros. suspense and adventure films. Lorre played the role of Joel Cairo in The Maltese Falcon (1941) and portrayed the character Ugarte in Casablanca (1942). Peter Lorre made nine movies altogether with Sydney Greenstreet counting The Maltese Falcon and Casablanca, most of them variations on the latter film, including Background to Danger (1943, with George Raft); Passage to Marseille (1944, reteaming them with Casablanca stars Humphrey Bogart and Claude Rains); The Mask of Dimitrios (1944, with character actor Greenstreet receiving top billing); The Conspirators (1944, with Hedy Lamarr and Paul Henreid); Hollywood Canteen (1944); Three Strangers (1946), a suspense film about three people who are joint partners on a winning lottery ticket starring top-billed Greenstreet, Geraldine Fitzgerald, and third-billed Lorre cast against type by director Jean Negulesco as the romantic lead; and Greenstreet and Lorre’s final film together, suspense thriller The Verdict (1946), director Don Siegel’s first movie, with Greenstreet and Lorre finally billed first and second, respectively. 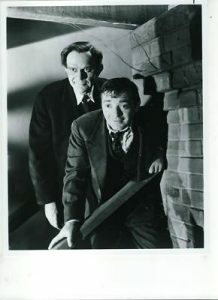 Peter Lorre also branched out (without Greenstreet) into comedy with the role of Dr. Einstein in Arsenic and Old Lace, filmed by director Frank Capra in 1941, released in 1944, and starring Cary Grant and Raymond Massey. In 1941, Peter Lorre became a naturalized citizen of the United States. After World War II, Peter Lorre’s acting career in Hollywood experienced a downturn, whereupon he concentrated on radio and stage work. In Germany he co-wrote, directed and starred in Der Verlorene (The Lost One) (1951), a critically acclaimed art film in the film noir style. He then returned to the United States where he appeared as a character actor in television and feature films, often spoofing his ‘creepy’ image. In 1954, he was the first actor to play a James Bond villain when he portrayed Le Chiffre in a television adaptation of Casino Royale, opposite Barry Nelson as an American James Bond. (In the spoof-film version of Casino Royale, British comedian Ronnie Corbett comments that SMERSH includes among its agents not only Le Chiffre, but also “Peter Lorre and Bela Lugosi”.) Also in 1954, Peter Lorre starred alongside Kirk Douglas and James Mason in 20,000 Leagues under the Sea. A famous story is told in Hollywood that in 1956, both Lorre and Vincent Price attended Bela Lugosi’s funeral. According to Price, Lorre asked him “Do you think we should drive a stake through his heart just in case?” However, according to Lugosi biographers Arthur Lennig and Gary Don Rhodes, neither actor attended Lugosi’s funeral. In 1959, Lorre appeared in NBC’s espionage drama Five Fingers, starring David Hedison, in the episode “Thin Ice”. In the early 1960s he worked with Roger Corman on several low-budgeted, tongue-in-cheek, and very popular films. He appeared in a supporting role in the 1961 film, Voyage to the Bottom of the Sea. In 1961, he was interviewed on the NBC program Here’s Hollywood. Peter Lorre was married three times: Celia Lovsky (1934 — 13 March 1945, divorced); Kaaren Verne (25 May 1945 — 1950, divorced) and Anne Marie Brenning (21 July 1953 — 23 March 1964, his death). In 1953, Brenning bore his only child, Catharine. In later life, Catherine made headlines after serial killer Kenneth Bianchi confessed to police investigators after his arrest that he and his cousin and fellow “Hillside Strangler” Angelo Buono, disguised as police officers, had stopped her in 1977 with the intent of abducting and murdering her, but let her go upon learning that she was the daughter of Peter Lorre. It was only after Bianchi was arrested that Catharine realised whom she had met. Catharine died in 1985 of complications arising from diabetes. In 1963 actor Eugene Weingand, who was unrelated to Lorre, attempted to trade on his slight resemblance to the actor by changing his name to “Peter Lorie”, but his petition was rejected by the courts. After Lorre’s death, however, he referred to himself as Lorre’s son. The incident was dramatized in Peter Lorre vs. Peter Lorre, a 45-minute radio play written/produced by Michael Button, directed by Toby Swift and broadcast on BBC Radio 4’s Afternoon Play on 10 May 2010. 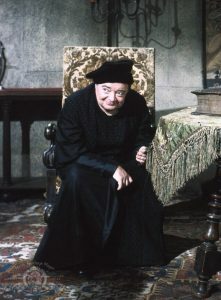 The cast starred Stephen Greif as Peter Lorre, Peter Marinker as Lester Salkow, Kerry Shale as Robert Shutan, John Chancer as Curtis Gemmil, Helen Longworth, Kenneth Collard, Nathan Osgood and John Rowe. Peter Lorre had suffered for years from chronic gallbladder troubles, for which doctors had prescribed morphine. Lorre became trapped between the constant pain and addiction to morphine to ease the problem. It was during the period of the Moto films that Lorre struggled and overcame his addiction. Abruptly gaining a hundred pounds in a very short period and never fully recovering from his addiction to morphine, Lorre suffered many personal and career disappointments in his later years. He died in 1964 of a stroke. Lorre’s body was cremated and his ashes were interred at the Hollywood Forever Cemetery in Hollywood. Vincent Price read the eulogy at his funeral. Lorre has a star on the Hollywood Walk of Fame, at 6619 Hollywood Boulevard.